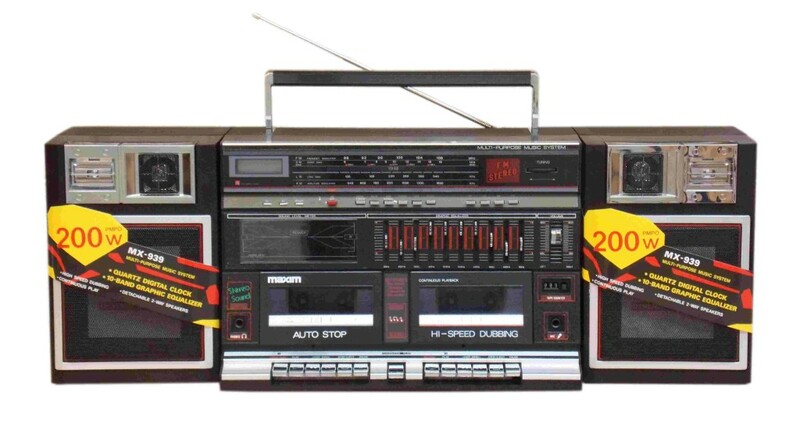 When Marty McFly visited us recently, he dropped off a magnificent load of original 1980s stock that time forgot – Ghetto Blasters with detachable speakers. Seriously awesome vintage (see them here) and still in the original boxes! They came from an old warehouse where the distribution had gone bankrupt in 1987. The warehouse was then locked and only opened back up last year and was full of brand new stock from the 80s! These have been going great guns for our customers – we couldn’t be more pleased. So as an additional tribute to Back to The Future films, I thought we’d have a look at other fabulous vintage hordes of goodies. A Titbits magazine from 1971 with a front page headline about Coronation Street which read “Elsie Tanner is as common as muck”. The shop was originally opened in 1890, and was run by several families over the years. Margaret Boyd and her husband, nicknamed Curly by shoppers, ran the store from the 1950s until it closed in the 1970s. It was popularly known as Boyd’s. While the council wished to preserve the shop, there were issues with safety and Alan took most of the historic goods from the premises to sell to collectors. A tower block in Hove was the unlikely setting for an interesting larder find. 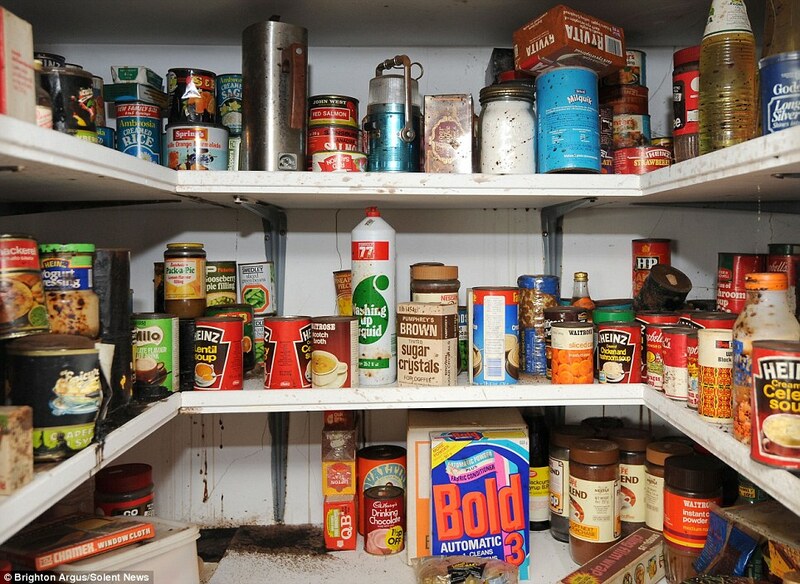 Ronald Mclintock, the caretaker of the tower block, made the extraordinary discovery when he came across the larder on the eleventh floor of his building, which hadn’t been open for 40 years – because there was no key. Instead, Mclintock used an angle grinder to open the door. He was instantly transported back in time by what he found. 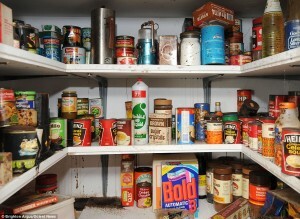 Inside he discovered over 250 cans of food and essential items bought in the 1970s – and all of them in near-perfect condition. Dating the horde was relatively easy. The items were priced with post-decimal labels meaning they were stored after 1971, but still had half pence on their prices. Halfpennies were abolished in 1984. The Bold detergent was launched in 1974 and this packaging remained on the shelves until 2004, when it was given a major revamp. The design of the Heinz soup on the right has barely changed. Pumphrey’s sugar crystals (far right) are no longer available. Also in the cupboard were Cadbury’s Drinking Chocolate, Heinz lentil and chicken and mushroom soup, mackerel in tomato sauce, Waitrose scotch broth soup and washing-up liquid, packs of Johnson’s baby powder and cling film. Ambrosia rice pudding and Batchelors Pack-a-Pie, baked beans, jars of coffee, unused pots and pans, a variety of cleaning products and powdered milk fill out the cupboard which had products bought from a range of shops including Sainsburys, Waitrose and ‘International’ (which became Gateway). The cupboard was not in a flat but next to an access point and Mclintock only made the discovery because he asked why no one had ever opened it. No one in at the flats knows why the items would have been stored in such an unusual place or who may have put them there. 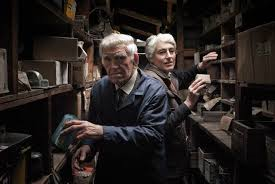 Mclintock noted that, ‘Apart from an exploded tin of prunes, it was in perfect condition,’ but he thinks that because, ‘The seventies was a very uncertain time, with the miner’s strikes, the three day week and the Cold War – so maybe someone was preparing for the apocalypse’. 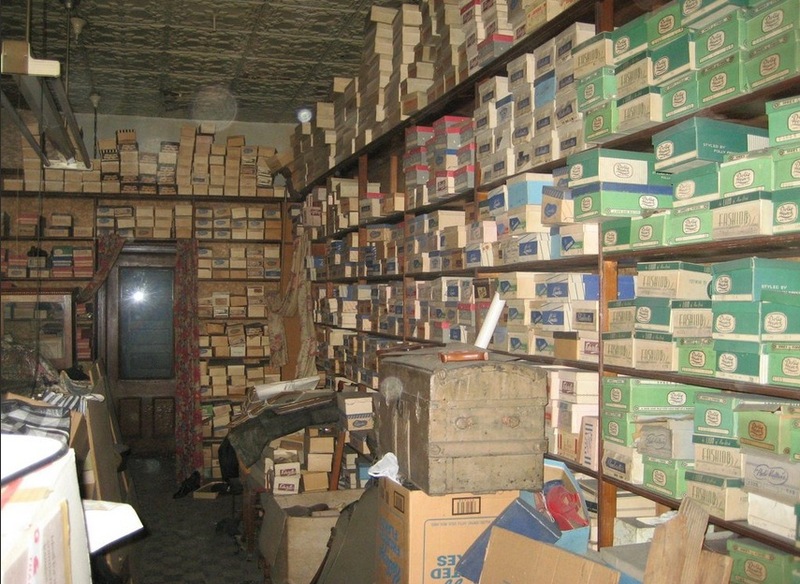 A shoe shop that closed forty years ago in the USA, is well hidden from public view and is a treasure chest of fancy footwear dating back more than 70 years. 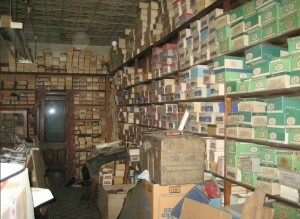 A member of Reddit, Oktober75 shared photographs documenting the inside of his family’s old shoe store which once upon a time was open for business, from the 1940s until the 1960s and run by his great grandmother until she fell ill. Sadly, the store was never re-opened. Now, the shoes are in variable condition. They are unworn but in many cases the rubber soled shoes or sneakers have become so brittle and dry that they’re too stiff to even bend. However, a few years ago, a production company for vintage costumes and clothing came by the shop and bought a couple of hundred pairs from Oktober75’s grandparents. Oktober75, is currently exploring options with his family on what to do with this Aladdin’s cave of fashion footwear history. 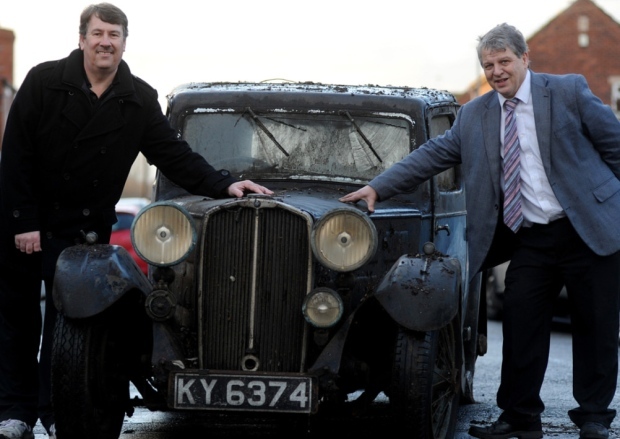 No-one knows what lurks in the depths of people’s garages, usually just junk, but one family in Yorkshire got lucky when a relative who spent a lifetime hoarding, left them a century’s worth of collectibles – including Triumph cars hidden in his crumbling garage. Clifford Fevre was a lifelong bachelor who had a reputation for being a bit of a compulsive hoarder, and his house in Doncaster was filled with all manner of weird and wonderful objects. Tucked away in a rotting wooden garage, which was on the verge of collapsing, the family found a Triumph Gloria from the 1930s and another Triumph model from the 1970s. Clifford’s niece recalled that, “he was a lovely person, very baby faced. I remember he was a 25mph man, a very steady driver.” Gloria made her final trip in the 1960s and was then garaged for good. Clifford’s house contained furniture and collectibles dating from the last 100 years. It was an Aladdin’s cave – nothing had been thrown away for three generations, but the piece de resistance was Gloria and all of her original manuals and literature. When William White died in 1909, his shop was boarded up by his son. William was a chemist but unfortunately Edward was not and so he wasn’t qualified to dispense drugs. Once closed the shop remained untouched for nearly 100 years until it was rediscovered in 1987 after being locked away and forgotten in South Petherton in Somerset. The shelves contained all of the original bottles of lotions and potions, although they had gathered dust and cobwebs having not seen the light of day in 80 years. The shop was bought by Flambards who painstakingly re-assembled everything exactly as it was found – minus the poisons and more dangerous compounds that had been confiscated by the Home Office! Every item in the shop was numbered and charted so that when it was re-assembled at Flambards – everything was exactly as it had always been. You can visit the shop at Flambards in Cornwall, and see the walls lined with medicine bottles, apothecary jars, quartz carboys, demijohns, pill dispensers and mortars and pestles. It’s an eerie time capsule and reminder of a lost age. 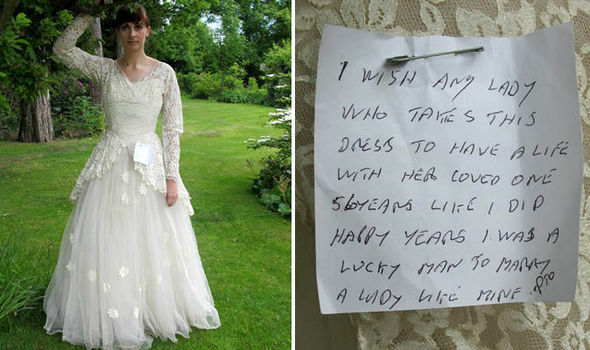 You may have heard about the charity shop wedding dress which sparked a social media frenzy to find the ‘gent’ who had lost his love, recently. A worker in a charity shop found a vintage ivory wedding dress in a bundle of donated clothes. Aysha Alton was first amazed, and then moved to tears when she found a note attached to the garment. A Facebook post about the touching note has received attention from across the globe and the shop was sold on eBay to raise more money for the charity. The ivory dress, with intricate stitching, appears to have been custom-made to fit the bride. A small village shop in rural Nith Valley, Dumfriesshire in Scotland still sells boxes of goods marked with pre-decimal prices which may well have been placed there 80 years ago. 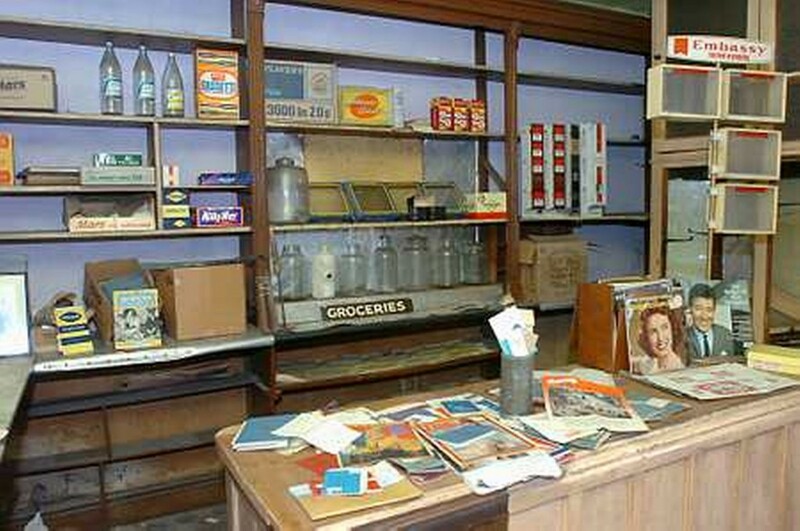 This store sells new products too, but its shelves and exterior haven’t actually changed for decades and many of the contents are forgotten, dust-covered and unusual, branded with the names of companies that have been out of business for a long time. There are no computers in the shop and the place is lit by gas light. The shop has been in the family’s possession since 1929 and the clock, which has probably been there since before then doesn’t work. Have you ever opened a cupboard and found something valuable? Do you hoard things in your garage? What would be your dream find? Wouldn’t you love to find stock that time forgot? Come and chat to us on our Facebook page here or leave us a message below. « Emoji PIN for the win!